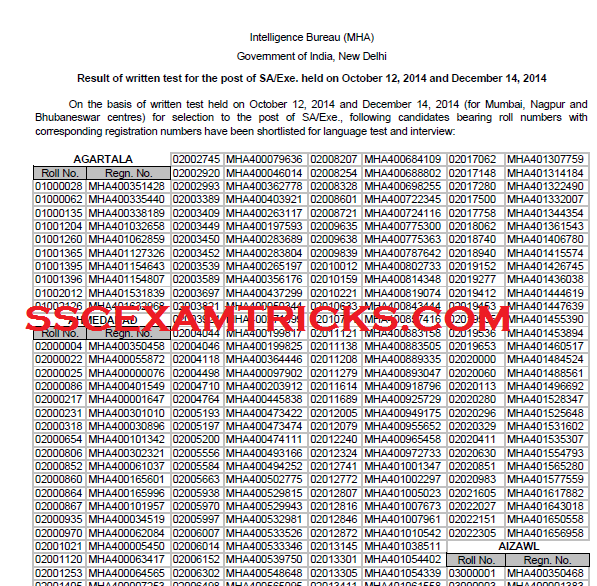 Mha.nic.in IB Security Final Result 2015 Declared – Download Mha Assistant 2014 Merit List Cut off – Download Mha IB Security Appointment Letter Joining Date mha.nic.in. Latest News Government of India, New Delhi, Intelligence Bureau of India (IB) has declared Security Assistant (Executive) Recruitment 2014-15 Final Result on 22 July 2015 on official website www.mha.nic.in. The Final result has prepared from written test and interview held earlier. The written test was held on 12 October 2014 & 14 December 2014 at Mumbai, Nagpur and Bhubaneswar exam centres. The qualified candidates were called for language test/ interview held in April 2015 for the post of Security Assistant (Executive). IB has uploaded roll number wise list of selected candidates who will be called for appointment to Security (Executive) post in the Bureau. The final selection list has categorized state wise (also caste wise list for reserved/ unreserved candidates) for the easy search of final result/ roll number of the candidates. Those candidates who scored above cut off marks in written test were eligible to attend local language test (50 marks) and personality test (50 marks) held in 19 & 20 April 2015 respectively. The LLT & Interview result has been announced on 22.07.2015. The finally selected candidates will be offer appointment letter for joining to the post as early as possible by Intelligence Bureau. The appointment offer letter containing joining date / reporting date will be sent by speed post/ courier to these selected candidates. Candidates will report on the date mentioned in the offer letter. In case, any candidates fails to report on joining date will not be entertained again in any regard. No query will be attended by IB. Candidates are advised to bring offer letter at the time of joining/ reporting along with original document which will be verified at the time of joining/ allotment station to the candidates. A set of photocopy of all original documents and two recent colored photographs will be required during performing joining formalities. A certain formats or hand written joining application will be submitted by the candidates to the head office of IB at joining time. · Any of Photo ID proof Voter Card ID, Driving License ID, PAN Card ID etc. Intelligence Bureau of India(IB) has released result on 13th March 2015 on official website of written examination which was conducted on 12th October 2014 & 14th December 2014 at Mumbai, Nagpur and Bhubaneswar centres for a total of 532 posts of Security Assistant Executive posts. IB has released result State wise containing roll number & registration no. in PDF File. The selected candidates are called for Local Language Test (LLT) & Personal Interview which is going to be held on 19th April 2015 & 20th April 2015 onwards respectively. The interview call letters will be released on 24th March 2015 for these shortlisted candidates which can be downloaded from the official website mha.nic.in. A huge number of candidates had appeared in the exam.Those candidates who had appeared in the Exam can find their result from direct link provided in the end of the posts. Intelligence Bureau (IB) is India’s reputed agency situated in Delhi, which handles the Security related issues in a Country and aware about the terrorist attacks to Govt. of India. The Final Selection of Candidates will be based on the performance in written test, local language test and personality test, candidates will be selected subject to successful completion of their character and antecedent verification followed by medical examination. IB Exam was conducted on 12th October 2014 by Pen MODE. The exam was entertained through filling of circles on Computer Generated Page (OMR sheet) containing answers as darkening circle on it. The OMR sheet was to be filled by Blue/Black ball point pen. The exam consisted of four sections English, Math, General Aptitude and General Awareness. The exam was a multiple choice question paper of 100 questions of 100 marks and four options were provided out of which candidates are required to choose one correct answer. Each section was consisted of 25 questions of 25 marks. The time duration was 2 hours or 120 minutes. Those candidates who meet specific standard in the objective type test will be further called for a local language test (50 marks) and personality test (50 marks). The language test will be held on April 19, 2015 and interview from April 20, 2015 onwards. The date, place and time of local language and personality test shall be intimated to the candidates online. The qualified or short listed candidates may be called for Interview and Personality Test which will be taken for 50 marks. A Merit list will be prepared based upon the performance of written exam and interview. Finally a list of selected candidates will be released on the official website of IB. To download the IB Security Assistant Exam 2014 for All Regions, Click on the direct link provided below.